One of our popular 'Classic Power for Classic Cars' collection. 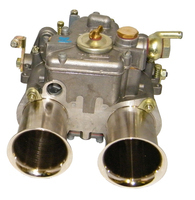 Weber performance carburetter kit for the Volvo B18/B20 series. The kit comes complete with 2 x 45 DCOE carburetters, inlet manifold, linkage kit and mounting. Comes complete with Weber Tuning Manual.